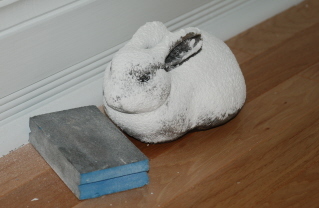 At 15:45 EST on January 14th 2007, the Drywall-Dust Bunny was actually spotted and photographed. This is the first known photograph of this elusive creature. Seen here, with a sanding sponge, Oryctolagus cloggusventus is actually trying to reproduce by making more drywall dust. Unfortunately, it was caught in the act and vacuumed up.